You could have been one of the runners who—during the events of the recent years—have seen him pacing with a custom banner along the race course, or you might have been a photographer who had their lenses snapped at this runner who has a habit of carrying a sign bearing a catchy message. If he ever caught your eye and wondered who he was, he’s known as Gian Carlo Dagar, the Signage Runner. 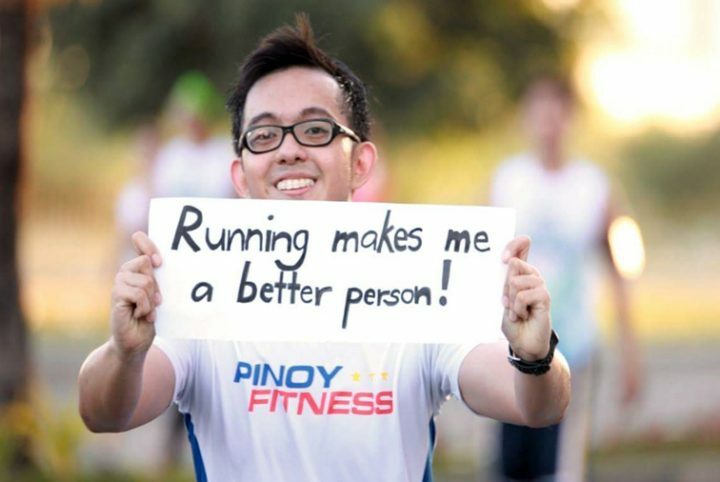 Nurse by profession but currently working as a Territory Manager for a multinational pharmaceutical company, Gian fell in love with running at the age of 21 and has since been running with signages that contain catchy messages. But apart from his consistency in running with banners displaying the quirky quotes and the motivational phrases, his signages often bear a touching message that anyone would go ‘awwwww’ for. 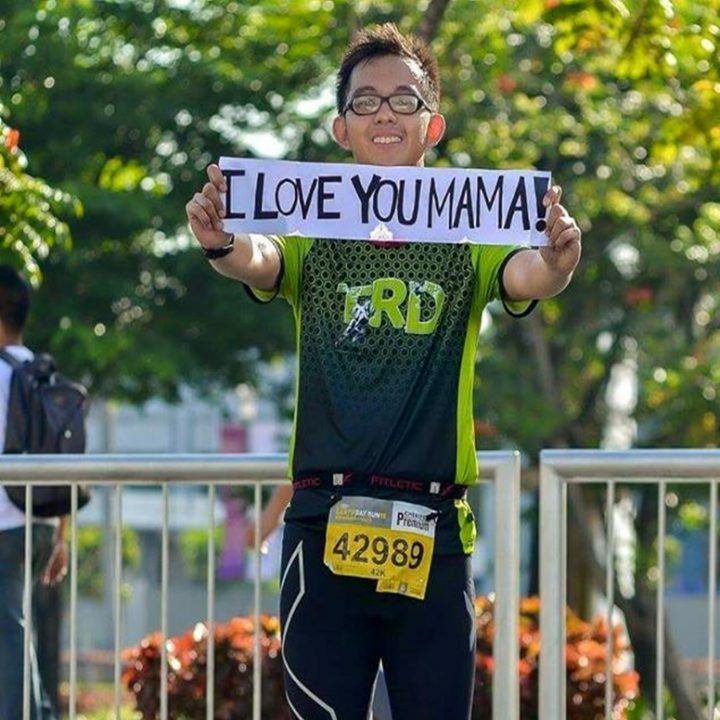 ‘I love you, mama!’ is what we regularly see his banners proclaiming, and with the frequency of this candid message at his races, we couldn’t help but to ask him why and where did it all start? It was 2012 and he was just about to graduate. Remembering the events that occurred around that time in his life, he utters; “naiiyak ako kapag naaalala ko ‘yun.” Joy of finishing a milestone in his life was mixed with worry for his mom as she expressed that she was feeling discomfort and pain in her knee. To put a finger on what was causing his mother such discomfort, he takes her to visit the doctor where, after undergoing a series of diagnostic procedure, was told that she had developed osteoarthritis—a debilitating disease of the joints that is irreversible. Things weren’t the same for Gian and his family, after that. Routine strolls around their usual mall started getting cut short, as his mom could barely go a hundred meters without needing to pause to ease the discomfort. And what used to be a fun, leisurely activity they bond over, the mall strolls eventually digressed to a burden that Gian couldn’t allow his mother to bear. They soon didn’t bother to do it as often as they did, anymore. Seeing his dear mother go through this and knowing that osteoarthritis was a preventable condition, Gian felt the occasional pang of frustration and fearing the possibility of him developing the condition, himself. But instead of allowing his fears and frustrations to eat him up, he chose to start running to work his knees to keep them healthy. 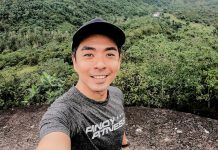 He joined running groups like Run Cabanatuan and Team Run Direction in Manila so as to train, and slowly built up to running races. “I am nobody, but it’s not about who’s running, it’s about who I’m running with,” he says. After the great reception of his touching message, with his mom being the proudest and most moved of all, Gian made bringing the banners a tradition that carries on to this day. 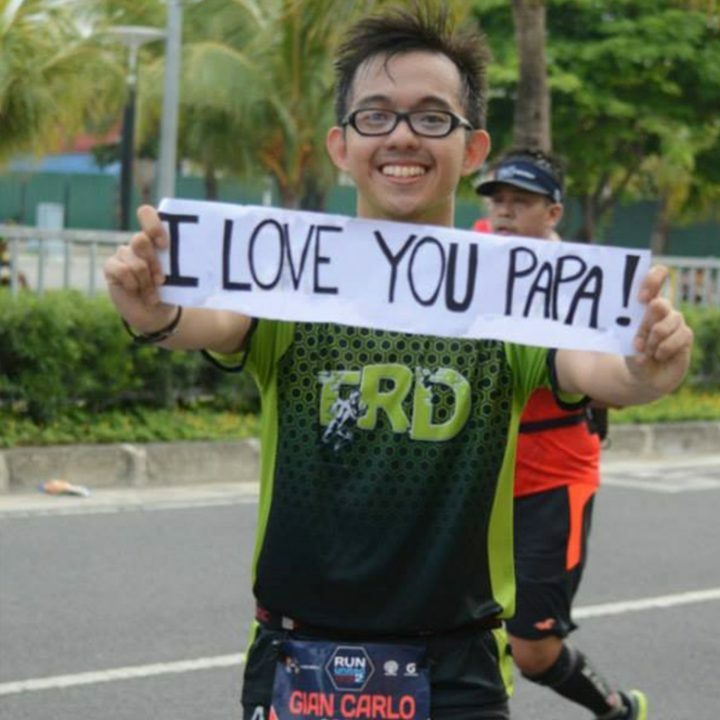 At Run United Leg 2 in 2015, he was seen carrying a sign proclaiming; ‘I love you, papa!’ to pay tribute to his father who helped him achieve most of the successes he garnered in life, till now. On top of the people he kept dearly in his heart, he also made signages for his fellow runners. Waving words that declare the ideals he would like to share to them in order to give them motivation during the races they run. “I guess, the best way to describe it is that a runner is best defined by the strength of his character and I want my fellow runners to share the same sentiments,” Gian said. 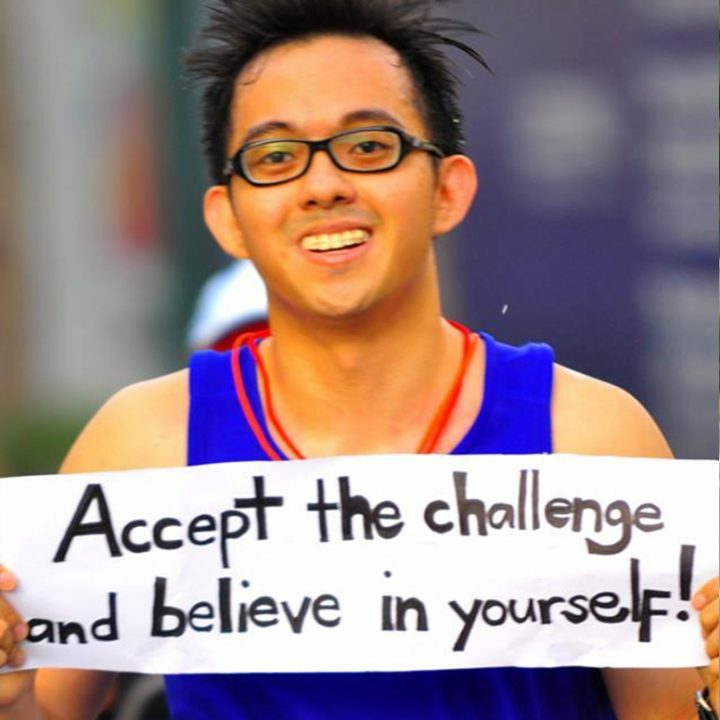 He says that going out of his way to do this for his fellow runners was inspired by the realizations he had when he started his running journey and one which kept him running for years: that crossing the finish line means more than just conquering a distance and that it entails achieving something valuable which can only be described in a runner’s vocabulary. 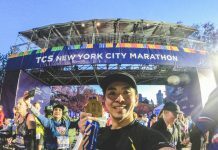 Having his mom as his greatest supporter backing him in his beloved sport, he continues to make use of this avenue to convince her and other runners that there really is so much more in life than just giving up. Gian expresses the interest in taking on as well the world of ultramarathon and triathlon, having been encouraged by his current running group; Team Heroes. 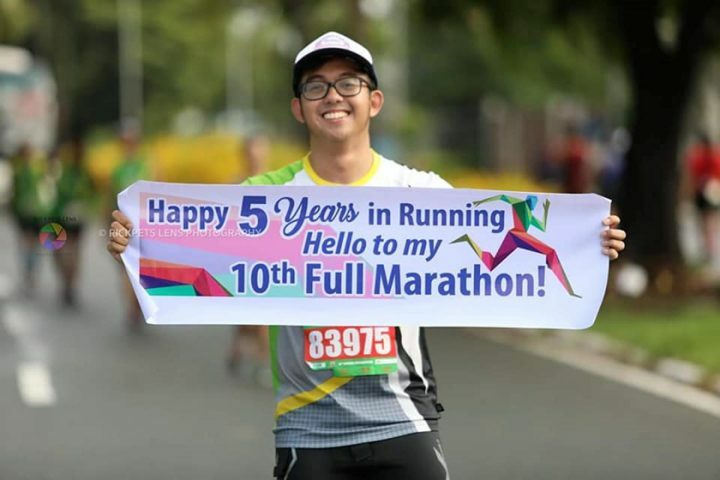 And as Gian promises to make similarly inspiring banners to bring to his future races—both in the realm of running and other multisport categories—he maintains that it is really about knowing “why” you run. Because at the end of the day, the distance and speed won’t make a lasting memory—the fulfillment of your purpose will.